Chameleon Store at our new location 2017. 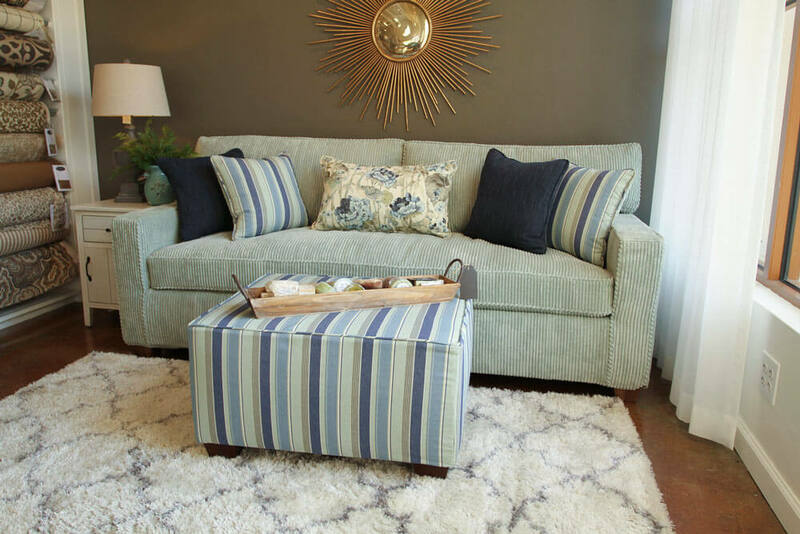 Displaying Chameleon Fine Furniture™ Kendall Sofa. Chameleon Style® is a magical one-of-a-kind retail fabric, furniture and design store on the California Central Coast that serves as the launching pad and manufacturing site for Chameleon Fine Furniture, Chameleon Style® Products and the Chameleon Style® Design Method. 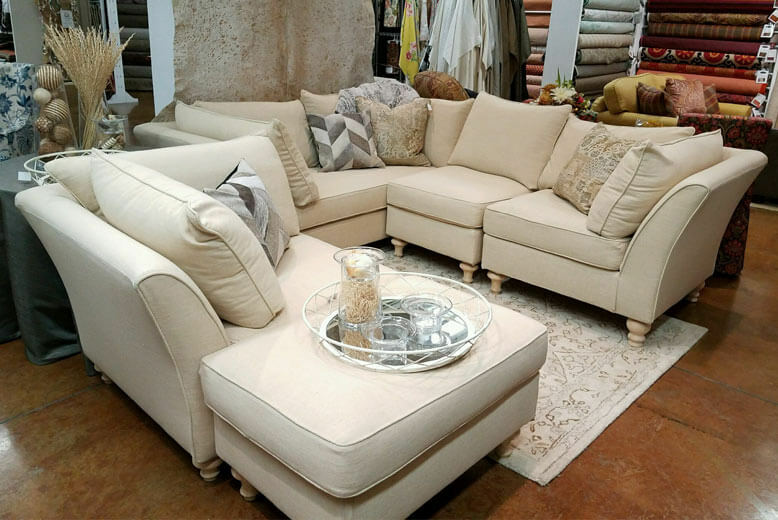 Chameleon in our new location, displaying the Chameleon Fine Furniture™ Lielle Sectional in Betul Wheat Fabric. How We Started – Purple Matters! Camay Arad, Chameleon’s founder, was newly single in 1988 and bought a fixer upper house which she then painted shades of purple (her personal “neutral” Bridge Color™) inside and out. Her lawn was mowed and trimmed anonymously for two months when one fateful Saturday afternoon she heard the sounds of the lawnmower and finally met her secret “ad-mowerer”, a handsome older volunteer firefighter who lived nearby. Camay and Win Tullis began dating but it was when they decided to marry and move into his home that their design tastes collided. She proposed slipcovers which he rejected, reminding him of slippy- sloppy covers his mother had. 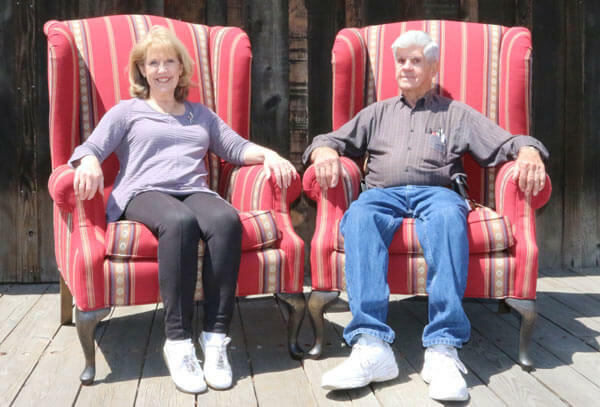 She knew there was a better way and in 1993, the purple house was sold and generated the start- up money for the development of Changeable Chameleon Fine Furniture™. 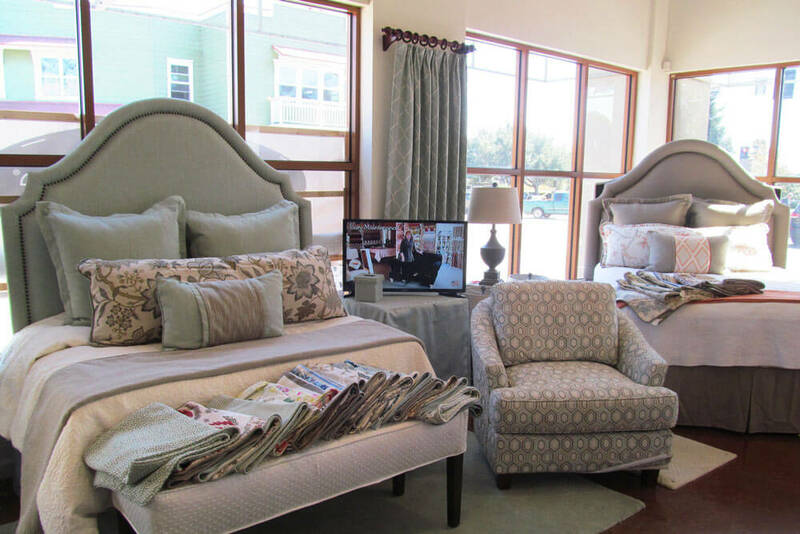 In 1997 Win and Camay opened Chameleon Style®, the retail fabric and home décor store in the Village of Arroyo Grande where it has been enchanting customers for over two decades. 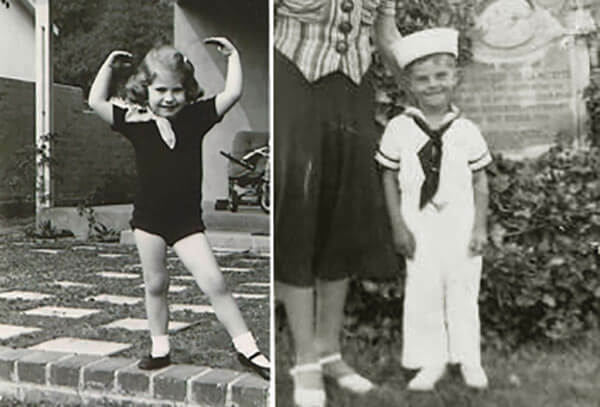 Camay and Win when they were children. In 2005 we moved to our current location in the 106 year old Loomis Grain Mill we affectionately call “The Barn”. 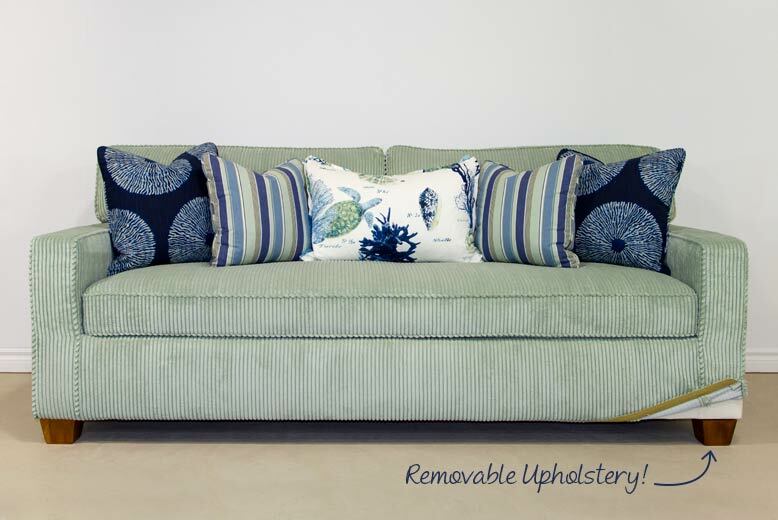 We now have our own team of seamstresses and upholsterers, and actually manufacture the furniture on the premises. We’ve expanded our inventory to over 400 bolts of decorator fabrics along with a great selection of gifts and accessories to complement any décor. In Spring 2011 we opened a second store in Pasadena, California in Camay’s old neighborhood. “My sweet, supportive 101 year old mother (Linnea) funded the opening of the store because she knows I’m a workaholic and it gave me a great excuse to visit and be with her more often,” says Camay. The Pasadena Store closed in 2013, as some new opportunities were on the horizon for Chameleon, but we are thankful for all of the wonderful and loyal customers and friends we have gained from the experience. Linnea passed away in 2014 at the ripe age of 102 years old. She is greatly missed by everyone at Chameleon. In August of 2016 we moved to our current location at the other end of the Arroyo Grande Village at 148 E Branch Street. Our new location is right in the heart of the village and we’ve already made it our new home. 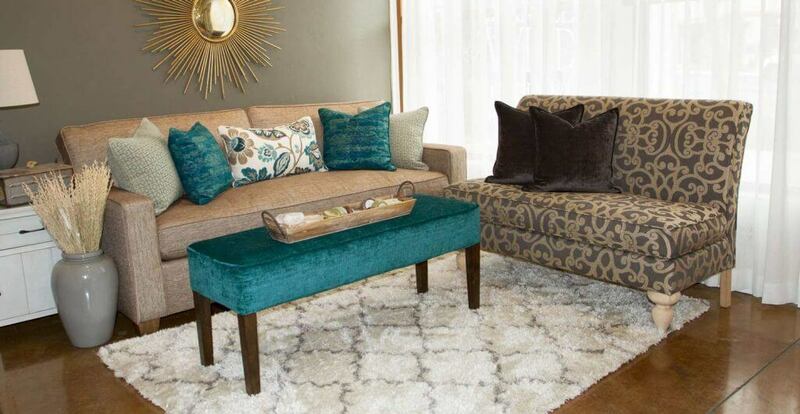 At the Arroyo Grande store, we have a team of people who can help with all your decorating and design needs, and guide you through experience the magic of “Chameleon Style® Decorating”. You can call the Arroyo Grande Store to set up and appointment (805) 481-4104, our just come on by! For more information visit our Contact page.